Only 2 left in stock - Order today! "The best for your money!" rave customers. A hands-down customer favorite, this waiters corkscrew has gotten raves for its incredible ease, sommelier style and the professional way it pulls estate-length corks without breaking them. A classic of the affordable kind, the materials are durable, the grip ergonomic, the double-hinge provides leverage and the Non Stick-coated worm a smooth glide. Serrated foil cutter, bottle cap opener, metal handle. Is the handle made of plastic or metal? BEST ANSWER: it's plastic but omg don't buy it I bought this thing for work (at an Italian restaurant) and it started making a weird squeaky noise after like five shifts and broke shortly thereafter. kinda mad I spent the money. ?? It is made of metal and it is a great cork screw. Can i get them inscribed? Yes. However, the space for any inscription is very limited. It's really only big enough for someone's initials. Is this the Evolution model? BEST ANSWER: Can you let me know how I would know whether this is the Evolution model or not? 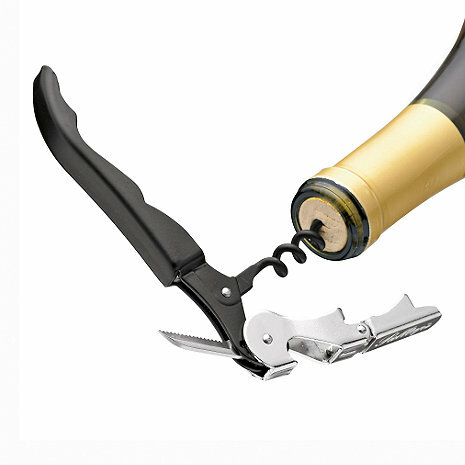 The Pull-Tap is simply a traditional double-hinged corkscrew. Does the product have the Pulltap's logo on the lever? BEST ANSWER: This item is no longer available from our vendor. There is no logo visible. Here's the deal:This corkscrew is the absolute best you can buy for the money, hands down, especially if you work on the floor for service in a busy, fine dining restaurant environment. That's not to say you can only use it in that environment, but this is the best one for that. It's quite effective, stylish, strong, ergonomic and made of durable materials. It rarely, if ever breaks the cork, due to its double-hinged design and truthfully, if a cork does break while opening wine, it's generally the fault of the operator rather than the corkscrew itself. [...] I'm a professional sommelier (Advanced level though the Court of Master Sommeliers) and I find it quite amusing whenever I see professionals with [$] Lagiole corkscrews thinking that somehow it makes them better wine stewards because they have one. Purchase a "pulltap" brand, and use the money saved on a wine book, you'll be glad you did. This is without a doubt the absolute best wine bottle openere I have ever used! It is the most perfect opener of all the ones I have used, and I have used a lot!!! I would recommend this to ANYONE!!! Got rid of my Rabbit! I ditched my Rabbit corkscrew for this one. It's a great price and easy to use. I suddenly prefer my waiter-style corkscrews to the "techy-looking" rabbits and screwpulls. Long live corks! I love the ceremony of uncorking a bottle of wine. This corkscrew works well AND it is inexpensive. The longer pull makes it a good choice for wines with particularly long corks or for those who are "challenged" in using waiter-style corkscrews. My first introduction to this Pulltab corkscrew was in Montalcino, Italia when a clerk threw it in my bag as a free bonus for my purchase. After trying it, I wished I had gotten some more. The double hinge makes it very easy to use, even for a nonprofessional like me. I was very happy to find the same item back here in the States on the WE website. Although it isn't "free" like the one I got in Italy, it is relatively inexpensive compared to may contraptions on the market. Unlike many of those (and I have tried a bunch of them), this is by far the most reliable and very easy to use. I purchased several to give to my grown children. Appearance is very stylish and professional. With a few practice sessions you can open any wine like a Sommelier... all you need to add is the tuxedo! Most reliable corkscrew I've owned or used. I have had less expensive and more expensive, without hesitation the Pulltap is THE BEST, bar none! Nonpareil. It works as advertised and very well...period. sometimes simple is better. gave one to my neighbor as well.she loves it. I saw this while purchasing a Laguiole corkscrew as a gift. The price seemed very reasonable, so i decided to give it a shot. Initially, i didn't think that the 2 stage process would be very efficient, but after opening 3 or 4 bottles with it I found it to be very quick and takes much less effort than standard waiters' corkscrews. The Teflon coated screw glides easily into the cork and the relatively long handle provides a lot of leverage. Highly recommended unless you want an attractive corkscrew. Easy to use and without effort pulls corks out evenly. The double fulcram hleps with the ease of pulling the cork. This is the only Corkscrew I Use! I use this corkscrew when opening bottles at the table and at the bar. It is by far the easiest corkscrew I have ever used. We use them at work and I even ordered one for at home! Bought for my daughter who works at a Hilton Hotel Restaurant. She has used many in the past and says it is the best ever. Perfect size, weight, durability for the professional. Had her name engraved (Did not go well) as people borrow them and don't return them. She wants to hang on to this one. Need to offer that as an option. I purchased this to use primarily for opening wine bottles. It was a big disappointment in that regard. The blade/cutter works just slightly better than a spoon. The corkscrew is difficult to line up and center on the cork and therefore goes off the mark, sometimes breaking the cork edge. Furthermore, it is quite long so you have to pay attention to cork depth so you don't pierce the cork and push cork pieces into the bottle. I've opened many wine bottles with this type of opener and especially like double hinge openers like this - just not this one. On the plus side, it is a nifty bottle opener/can opener and has a nice feel in the hand. As a wine bottle opener, it is functional but not my first choice. I read other reviews and bought it based upon some of the raves, but was pretty disappointed. My husband has had one of these Pulltap's corkscrew and really liked it. So, I bought three - one for our camper and one for each of our sons. When they came, I became concerned because the original one had a "PATENT" inscribed on a surface, but the ones I bought from you do not have such an indication of patent. Since I paid the most for these three as opposed to others which had the same "name" but were cheaper than the ones I bought I hope they will work as well as the original one. My favorite waiter's corkscrew - good quality and easily penetrates corks. Hinge operation is smooth. Highly recommend! Great corkscrew for a great price. Lightweight and easy to use. Great cork screw. impossible to break the cork. I have given this as gifts every year. I waited for a few months and some serious use before making any comment. This is one great corkscrew - seriously considering purchasing a second one and tossing out the one I currently use when I travel. You will not go wrong purchasing this product! This has become our favorite wine opener, and we've purchased more to give as gifts to our friends. The only cork screw that I ever had that will open any bottle of wine. Things should never get more complicated than they have too. This opener does the job just right every time. So many years... so many broken corks! That dual hinge really does the job. With the old single hinge pullers I'd end up with a break maybe 1 out of 10. But was so embarrassing. This double hinger keeps perfect linear alignment, not bending the cork which was the cause of occasional breaks. BTW, I became so mesmerized by it that I broke down and bought another... their Toledo! Beautiful wood handle, solid massive feel. I love showing it off at the wine bars in Santa Barbara and Santa Ynez Valley vinyards. it is the second time I bought it. The first one is as good as new. It will last a long time. Fast shipping and quick delivery! This is the last corkscrew I'll ever buy. It makes short work of any cork I've encountered. Best waiter corkscrew I've seen by far. I'll never go back. I can now open any wine bottle without fear. Best corkscrew I have ever owned! Prompt shipping and arrived in perfect condition. I was tired of breaking estate-length corks and used this at my daughter's house. I ordered one the next day. The teflon worm is smooth, the serrated knife cuts foil and plastic alike, and the double-action lever allows an easy first pull followed by a complete second pull. I collect vintage Ports; this tool allows me to pull the long corks without breaking. Highly recommended. I enjoy a good bottle of wine with dinner nightly and I love sharing wine with friends. For this I use an electric cork puller. I also love sharing a good bottle of wine with a special lady friend in a picnic setting and that is where this tool is indispensable. It has a good blade for cutting foil, a strong screw and compound leverage for pulling corks. It is slim and fits easily in in a pocket or picnic basket. It's always up to the job. the best wine opener I havw ever used. Simple perfect design. Works just like it's supposed to. I have always struggled to open wine bottles easily but not since I bought this wine opener! Great for my picnic basket! I was always taking corkscrew from kitchen drawer when going on an outing, so now I will have this in picnic basket at all times! Easy for women to use. This is the best.opener and I would definitely recommend it. We were looking to replace one of these we had for years - so well used the screw part snapped off in a cork! This one is just as good, anyone can open any cork from any bottle with it. This looked like an upgrade from my current opener, and it was. easy to use. I am in culinary school and this is the only opener my professors allow. As noted above I bought as a gift based on the ones I own so I am sure they are loving it. However, these can be difficult because there are some frauds out there. Price is definitely right. Works smoothly and very easy to use. Not fancy, but very functional.